IRRECONCILABLE DIFFERENCES: Can the North Carolina battle over barbecue be mediated? Posted on May 30, 2005 | Comments Off on IRRECONCILABLE DIFFERENCES: Can the North Carolina battle over barbecue be mediated? Today is Memorial Day here in the U.S. For those of you who are not familiar with American customs, on Memorial Day the U.S. honors those men and women who laid down their lives in performing military service for this country. 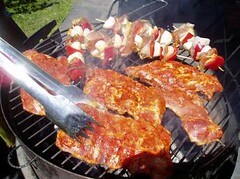 Memorial Day weekend is also the unofficial beginning of barbecue season. You would think that the start of the summer grilling season would represent a time for families and friends to come together and for differences and long-standing feuds to be set aside. Seems we’re going to have to bring in that fellow from Deltona, Florida, who offered to mediate a land dispute between city and county officials with the help of some of his homemade barbecued pork ribs.